I’ve wanted a Yonanas for quite some time now. You may remember I blogged about this cute little appliance a few months ago both on my own Christmas Wish List, as well as on Scoop Nutrition’s. Well, sadly Santa missed my hints, so you can imagine my excitement when the kind people at Yonanas gifted me with one to use at home. Somewhere in between a juicer and a food processor, the Yonanas purees frozen fruit into a creamy, soft serve ice cream-like texture, creating a healthy, seriously delicious dessert or snack. 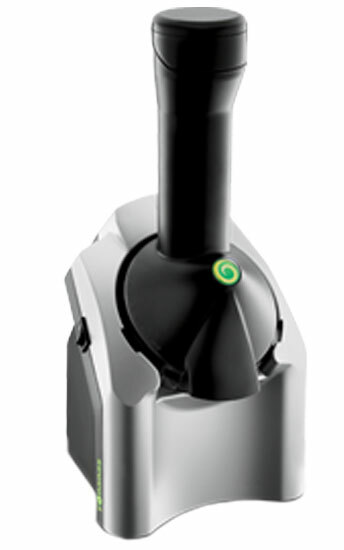 My first day with Yonanas saw me using it three times – it just tastes so great. Contrary to what the name suggests, there’s flexibility with what fruit you choose; I’ve had the greatest success with bananas, mangoes and strawberries. Honestly, I knew I was going to love the taste, but would anyone else? I tested it on those I knew would be the harshest critics – my fruit-evading boyfriend, my frozen-yoghurt shunning best friend, and my ‘allergic to bananas’ 7-year-old guinea pig. All three were suitable impressed, with Mr 7 even commenting that it was “just like frozen yoghurt, except with seeds” (probably best not to use blackberries if you’re after a smoother texture). I love that the Yonanas encourages the consumption of fruit, particularly in place of other unhealthier dessert choices. I can see the product being extremely popular with kids, and even those who aren’t hugely into fruit are sure to love the taste and texture. Unlike the substandard food processor I’d relied on previously, the Yonanas is solid and durable, with the advantage of actually being made to puree frozen fruit. Easy to assemble and disassemble, with very few parts, the machine is light and small enough to store without any worries. And the best part? It’s super easy to clean. All parts (aside from the base) can even be thrown in the dishwasher. 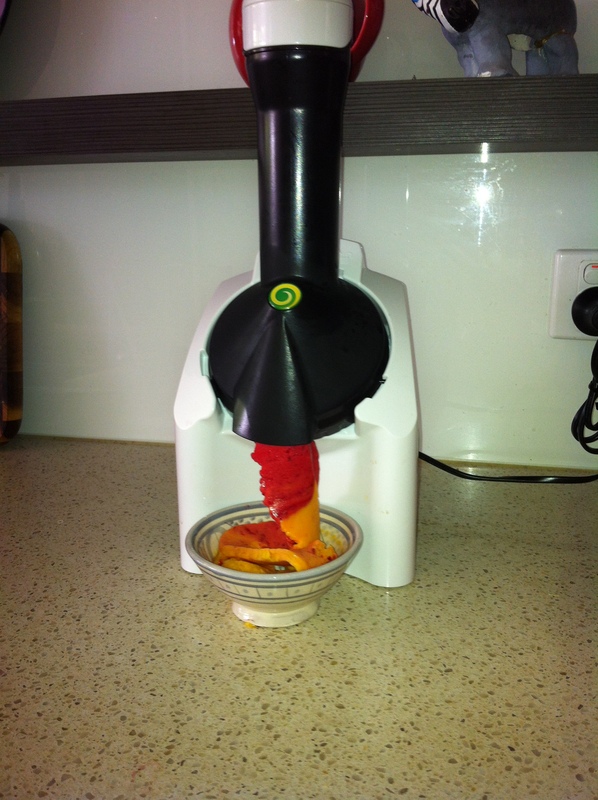 A few clicks and the machine is assembled, then it’s as easy as flicking a switch, and feeding frozen fruit through the chute. Its ease of use means that kids could be involved in the process, which really only takes 10 minutes from start to finish. 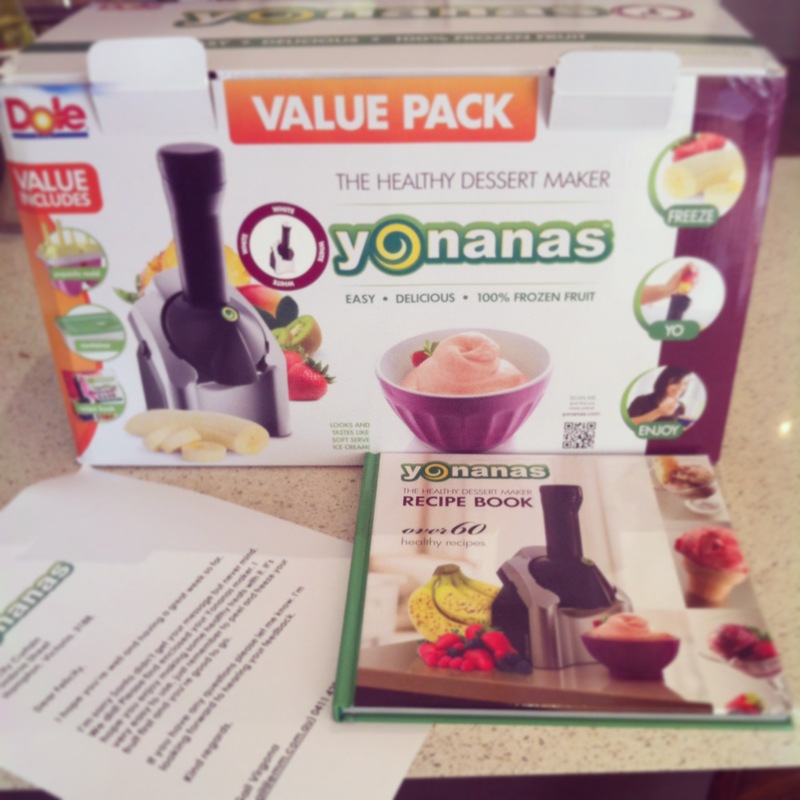 Now, it wouldn’t be fair for me to talk up the Yonanas so much without sharing it, and luckily the thoughtful team from Yonanas have offered to give away one more Original Yonanas machine (valued at $89.95) to a lucky reader. All you have to do is leave a comment down below or on my facebook page, detailing your most creative and delicious recipe idea you’d try if you were to win a Yonanas. If you’re stuck for inspiration, check out the recipe page on Yonanas’ website – Caramel Apple and Peanut Butter & Jelly are next on my list of things to try! *Open for Australian residents only, please leave your email along with comment to be contacted. Winner will be chosen Sunday 9th March 2014. Good luck! *Update: Congratulations to katarineanne on her winning recipe: Salted caramel and white chocolate hazelnut Yonanas! Hi Felicity, I’m super excited to read about the Yonanas! My housemates are obsessed with frozen yoghurt but I’ve never been a huge fan as they often seem to be filled with sweeteners and all kind of artificial junk. I’ve been looking for a decent alternative and this looks perfect (hopefully I can win one haha) I would love to try a salted caramel and white chocolate hazelnut Yonanas! Sprinkle toasted hazelnuts on top. Yum!! I’m such a sucker for salted caramel. Another fabulous post! I can imagine 2 x frozen bananas, a touch of cinnamon + some hot caramelised walnuts would be delicious for a bit of a Yonanas sundae. Not quite as healthy as the other options but still yummy. Hi Felicity – I’m a uge’ fan. oh my god, yumm! I would have to try a coconut, lime and pineapple concoction! Summer explosion! This would definitely work on my boyfriend who is also anti-fruit haha! Avacado, coconut milk and a touch of condense milk! I’m love an Asian avacado smoothie! 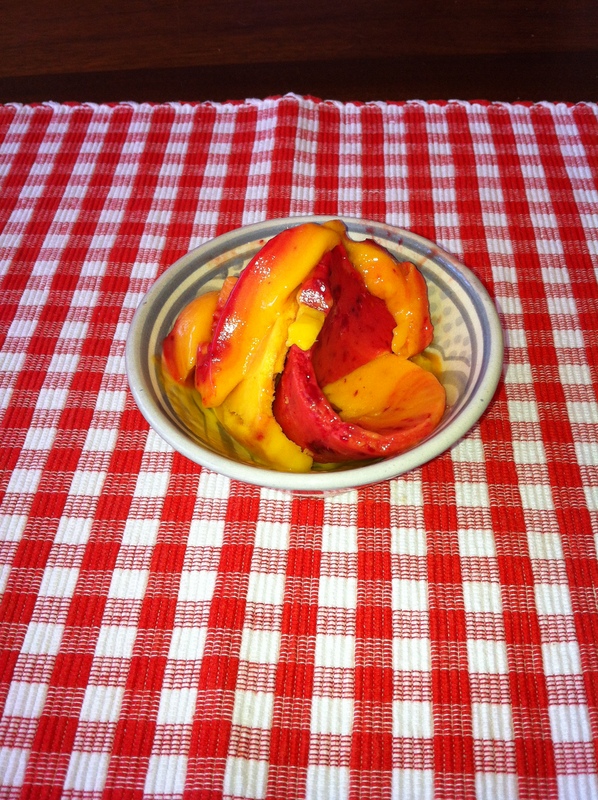 I would try 1 cup of frozen peaches and 1/2 a cup of frozen apricots and a little bit of maple syrup and vanilla! The first layer with 1/2 a banana, topped with a sprinkle of toasted slithered almonds, the second layer of 1/2 cup of frozen pineapple, topped with a sprinkle of slithered almonds again then 1/2 cup of chopped cantelope, topped with fresh strawberries and granola! Great post by the way!